The Folding at Home application on PS3 was developed by Sony Computer Entertainment, managed by Klaus in Foster City. It was part of the PS3 firmware from 2007 to 2012. Once released, it did not take long to reach more than one petaflop sustained distributed computing performance, a Guinness record – see also the Guinness site. The application was very popular, and there are people who bought a PS3 exclusively for the purpose of running Folding at Home. 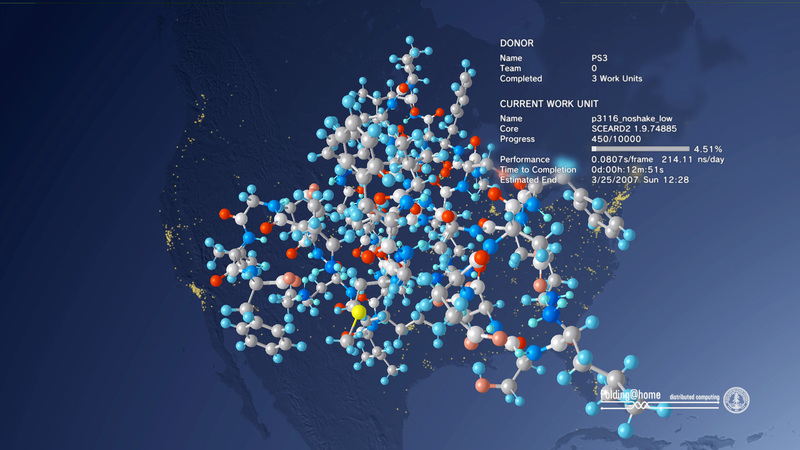 The application was running the Folding At Home client, but also showed a visualization of the molecule that is calculated. Users could use the game controller to zoom in and out, or rotate. 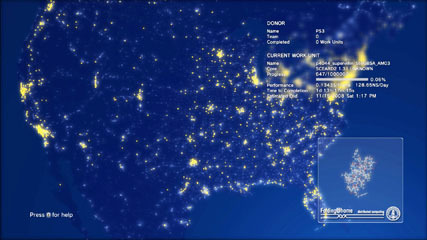 Most important for the visuals however was in the background: the earth that showed where in the world others are running the PS3 Folding at Home client. It is possible to rotate and zoom, and see where you and others are contributing.